Two servicemen of the Ukrainian Armed Forces were killed in fighting in the village of Shyrokyne in the Volnovakha district of the Donetsk region on Wednesday. 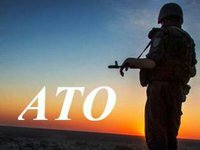 "An armed clash with the adversary occurred today in the locality of Shyrokyne, which is a neutral area. Confirmed reports indicate that two soldiers of the Ukrainian Armed Forces were killed in the fighting. Information about those injured is being verified," the Azov regiment said on its VKontakte account on Wednesday.